Tejinder Singh has represented parties and amici before the Supreme Court and lower courts. His matters have involved civil rights laws, financial regulation, privacy rights, environmental protection, and gaming statutes. Prior to joining Goldstein & Russell, P.C., Tejinder was an associate in the Supreme Court and appellate litigation practice at Akin Gump Strauss Hauer & Feld in Washington D.C. Before that, he was an associate in the London office of Allen & Overy, where he assisted clients with cross-border debt and equity transactions. 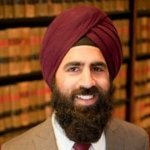 Tejinder clerked for Judge Diana Motz on the United States Court of Appeals for the Fourth Circuit.